A variety of durable rubber and polyester blend. Pull-on style with dual pull tabs in front and back. Haymarket check detail at shaft. Signature raised brand logo patch at the back of each heel. The brand advises that a white wax film may appear on the surface of the rubber boots and it may easily be wiped off with a damp cloth. This "blooming" effect is not a defect. Blooming is a natural process that occurs when the boots are exposed to extreme temperatures or temperature swings and the wax helps prevent the rubber from weathering. Product measurements were taken using size 35 (US 3 Little Kid), width M. Please note that measurements may vary by size. 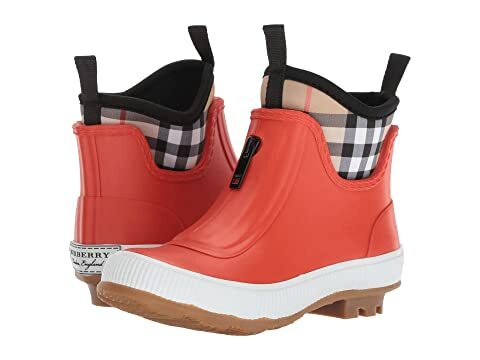 We can't currently find any similar items for the Flinton (Toddler/Little Kid) by Burberry Kids. Sorry!